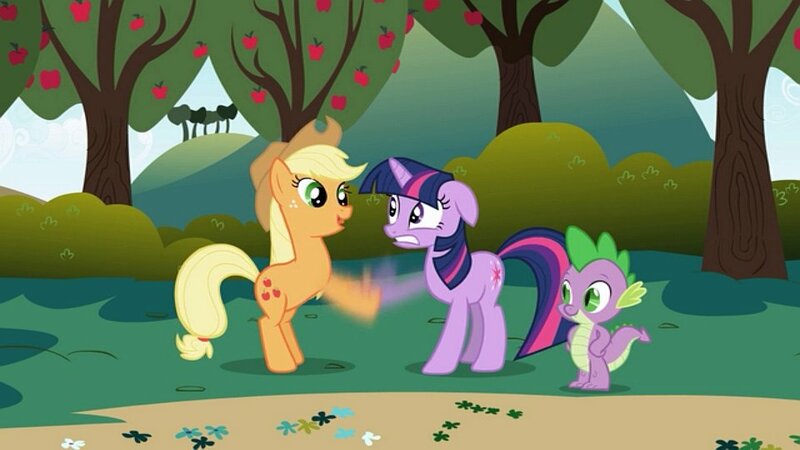 The first episode the first season of My Little Pony: Friendship is Magic aired on October 10, 2010. 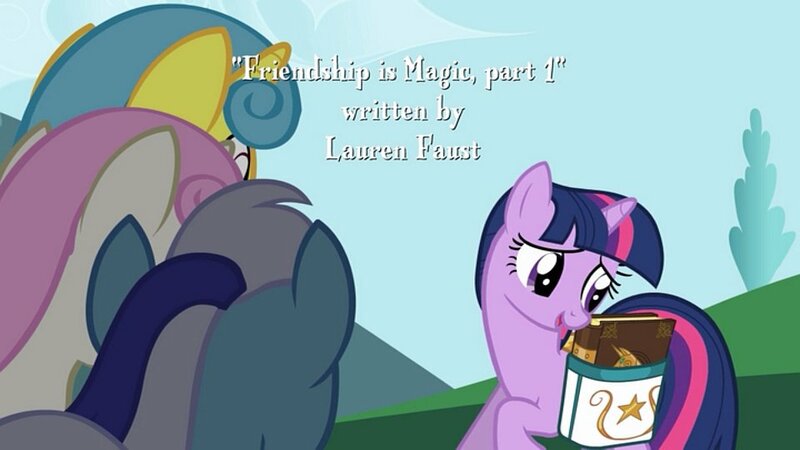 It is called “Friendship is Magic, part 1” or “The Mare in the Moon”, and was written by Lauren Faust. The episode opens with storybook-like narration: the land of Equestria was ruled by two sisters, princesses, the elder responsible for the day, and the younger for the night. The younger sister was jealous and sought to shroud the land in eternal darkness, calling herself Nightmare Moon. 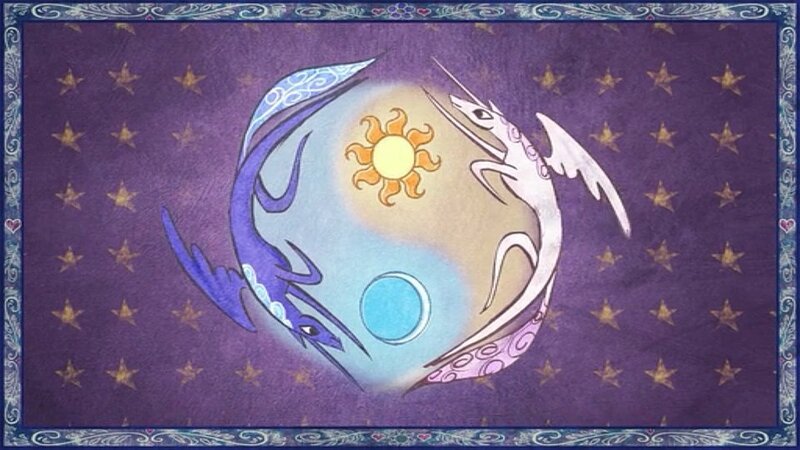 The sisters clashed, and the elder exiled the younger to the moon using the legendary Elements of Harmony. 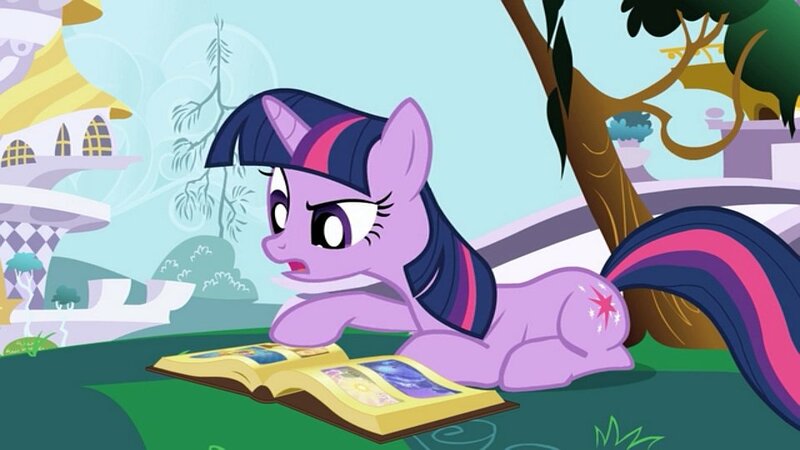 We see that this story is being read by the series’s central protagonist, Twilight Sparkle. She believes that a prophecy states that Nightmare Moon will return after a thousand years, which is this very year, and writes to her mentor, Princess Celestia, with her concerns. Princess Celestia seems not to be impressed by her student’s alarmism, and instructs her to visit Ponyville to oversee the preparations for the Summer Sun Celebration and to make some friends. 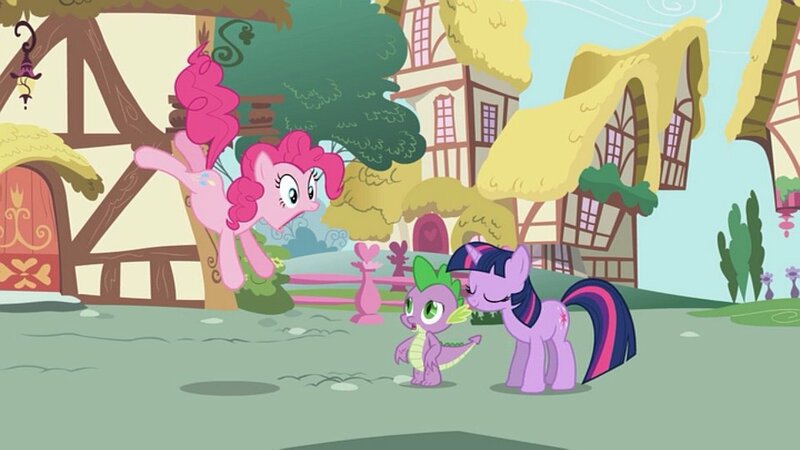 With her assistant, Spike, Twilight travels to Ponyville. Twilight meets several ponies while she’s checking on the preparations for the celebration; particularly: Applejack, Rainbow Dash, Rarity, Fluttershy, and Pinkie Pie. After a trying day and a sleepless night, Twilight waits for the Summer Sun Celebration to begin. Princess Celestia is supposed to come to Ponyville and raise the sun while the citizens watch, but she is nowhere to be found. Instead, Nightmare Moon appears before the frightened citizens, and declares that henceforth the night will last forever. 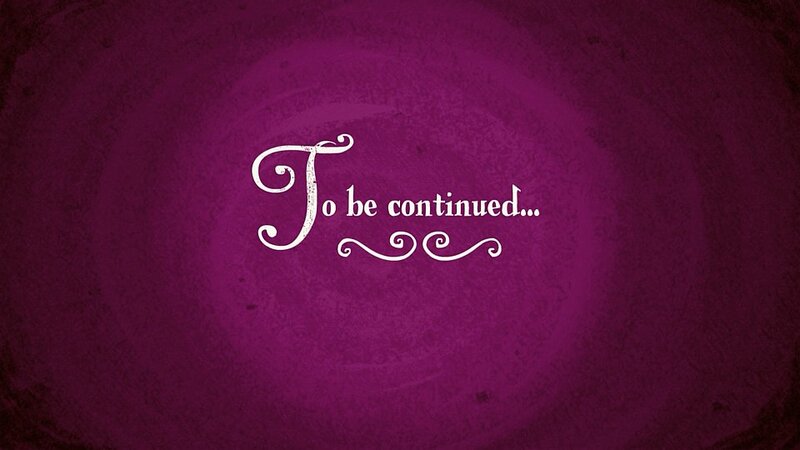 Although the second episode did not air for another week, the first two episodes form a single story. As a result, there’s no clear moral in this episode. Despite Twilight’s intention to quickly check on the preparations for the Summer Sun Celebration and then find proof of the upcoming return of Nightmare Moon, she is waylaid by several ponies who seem intent on becoming friends. As we will see in the following episode, though, this is all for the best. This episode is a great introduction to the series. I usually don’t like first episodes of television shows, but “Friendship is Magic, part 1” manages to both provide a lot of information on the world and characters and also tell a fun story. It’s an auspicious start. A lot is introduced in this episode. I’ve written notes about some of the more prominent things. Equestria is a new setting, created for this series. Previous My Little Pony cartoons were set in Dream Valley or Ponyland. We see that Equestria is home to unicorns, pegasi, and Earth ponies, and that the day and night do not simply come of their own accord, but are brought about by unicorn magic. Later episodes will show that other aspects of the natural world are also controlled by the ponies, through magic or other means. Twilight Sparkle is the central protagonist of the series. 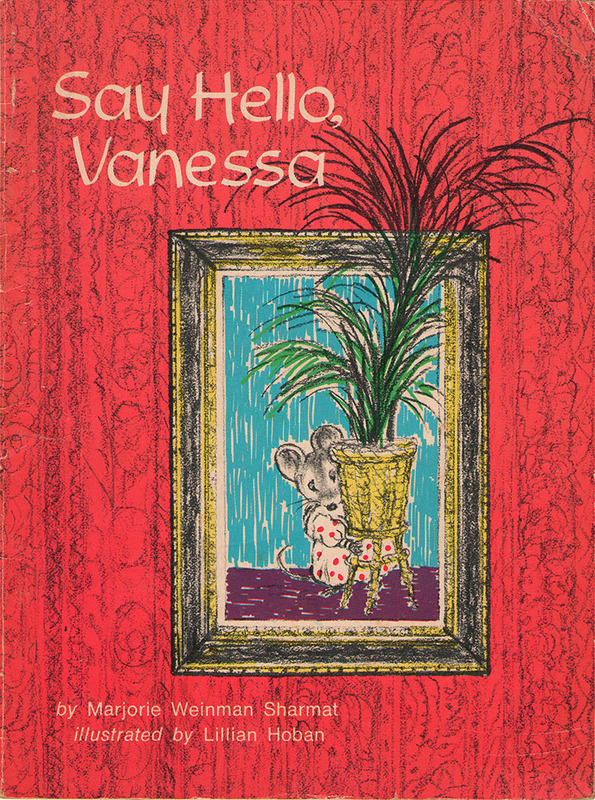 She’s a bookworm–the very first time we see her, she’s reading a book, and she skips a party in order to do some studying, prompting others to comment that she does nothing but study, and that she’s more interested in books than friends. Even her teacher, Princess Celestia, comments that she spends too much time reading, and should make some friends. She’s accompanied by a baby dragon, Spike. Spike is a returning character in the My Little Pony franchise, debuting in the first My Little Pony special, Rescue at Midnight Castle, and later appearing in My Little Pony: The Movie as well. 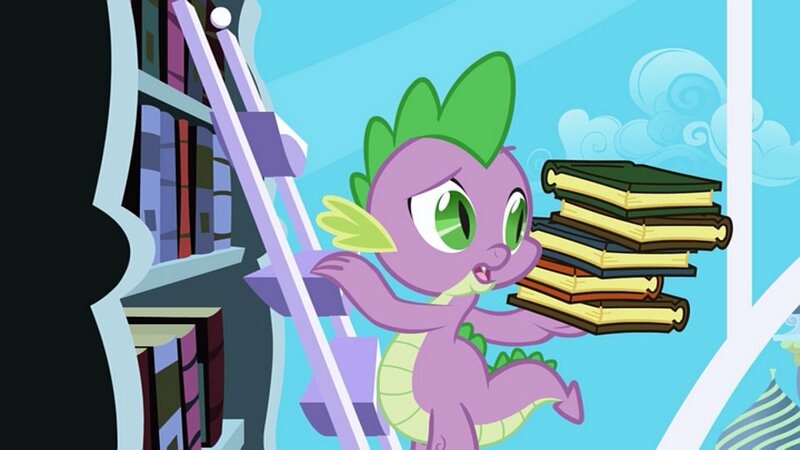 In Friendship is Magic, he is a baby dragon, and acts as Twilight Sparkle’s assistant. In the first episode, he becomes smitten with Rarity. Another returning character, Applejack also first appeared in Rescue at Midnight Castle. Applejack (and her farm, Sweet Apple Acres) is in charge of food for the Summer Sun Celebration. She enthusiastically introduces Twilight to her (large) family, and convinces her to stay for brunch. Applejack seems to be the most practical pony, holding back Rainbow Dash when she attempts to attack Nightmare Moon, and preventing Pinkie Pie from insulting her. There was a pony called Rainbow Dash in previous “generations” of My Little Pony, but she was an Earth pony. 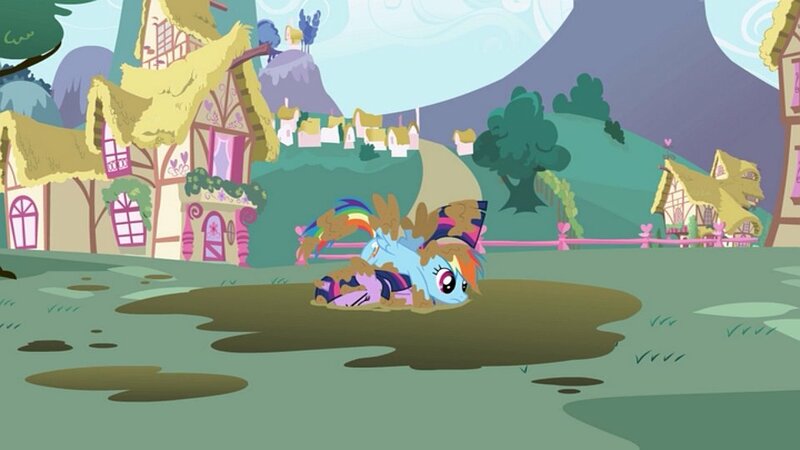 Rainbow Dash crashes into Twilight just as Twilight is looking for the pegasus who was in charge of the weather. Rainbow Dash intends to impress the Wonderbolts with her flying skills when they are in Ponyville to perform for the Summer Sun Celebration. When Twilight meets her, Rainbow Dash hasn’t yet completed her task, but after some goading, Rainbow Dash clears the sky of clouds in ten seconds flat, prompting Spike to comment that she is amazing. When Nightmare Moon appears, Rainbow Dash makes to attack her to try to rescue Princess Celestia, but is held back by Applejack. As with Rainbow Dash, there was a pony called Rarity in previous generations of My Little Pony, but she was pink, unlike the current version. Rarity is in charge of decorations for the Summer Sun Celebration. Twilight meets her after her run-in with Rainbow Dash, and Rarity insists on fixing Twilight’s hair, which had become rather mussed. 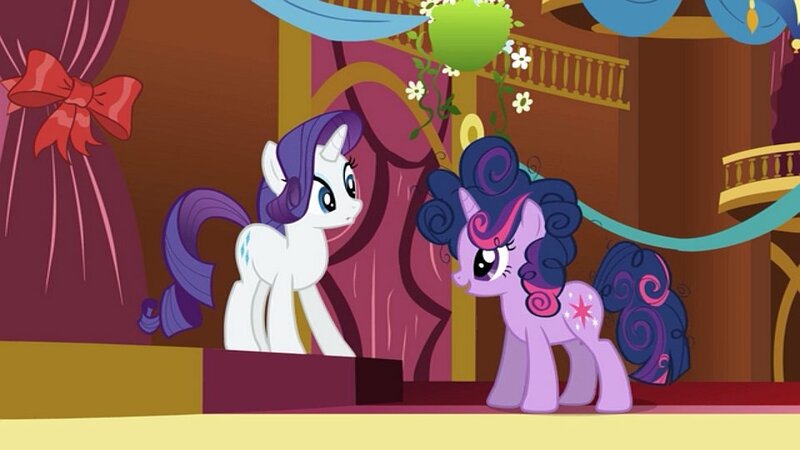 Spike thinks Rarity is beautiful, and develops a crush on her. Fluttershy is in charge of music for the Summer Sun Celebration, and is conducting a chorus of songbirds. 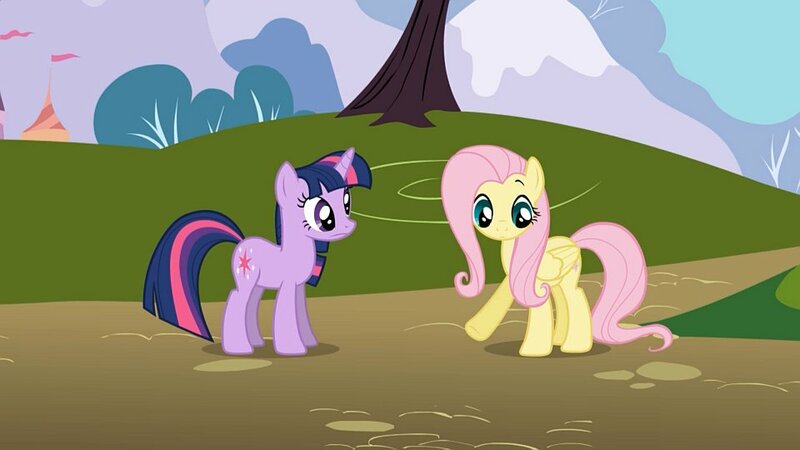 When Twilight meets her, Fluttershy is, as her name suggests, very shy–so much that she can’t even speak her name. When she sees Spike, though, she is very interested in him, and acts much more confident. Pinkie Pie appeared in many previous MLP cartoons. Pinkie Pie is actually the first pony Twilight meets upon arriving in Ponyville, but she runs off before introducing herself. 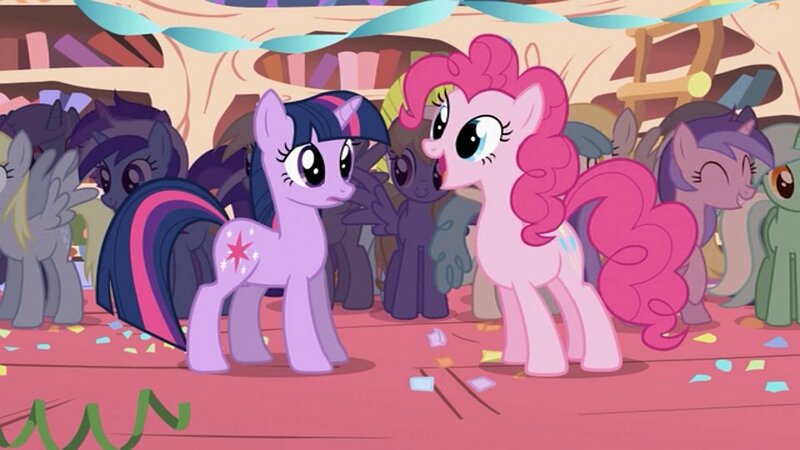 Later, when Twilight arrives at the library, hoping to do some studying, she finds that Pinkie has thrown her a party to welcome her to Ponyville, so she’ll have lots of friends. When Nightmare Moon appears, and asks if the ponies have all forgotten who she is, Pinkie Pie begins irreverently guessing insulting names for her, before she’s silenced by Applejack. 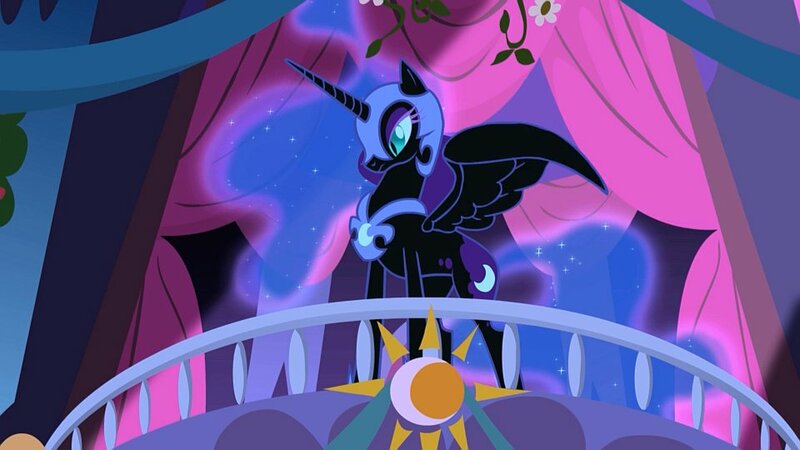 Although she appears only for a couple of minutes at the end of the episode, Nightmare Moon certainly makes an impression. She seems resentful of her long imprisonment, and displeased that the ponies do not find her “royal enough” for them. She has somehow displaced Princess Celestia, and promises that henceforth the night will last forever. Foreshadowing! 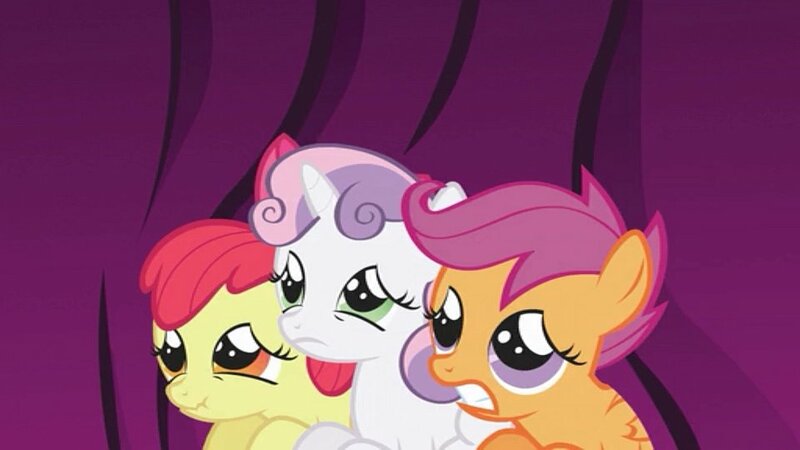 Although we won’t really meet them until the twelfth episode, “Call of the Cutie”, we see Apple Bloom, Sweetie Belle, and Scootaloo together even in the first episode.